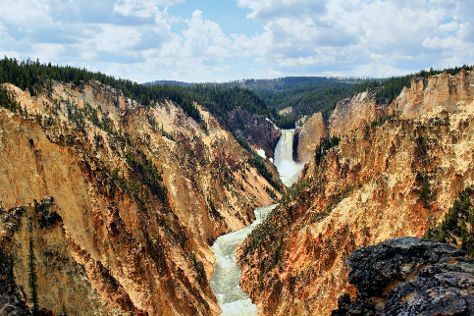 An exceptionally diverse landscape and varied wildlife have made Yellowstone National Park one of America's most popular parks. Visitors flock to see geysers spouting scorching water into the sky and hot mud bubbling from the earth. Trickling hot waterfalls create terraced terrain and a carved canyon of yellow rock draws more than 3 million visitors to the 8,983 sq km (3,468 sq mi) park each year. America's first national park is home to the majority of the world's geysers, and this geological feature is the park's main draw. Yellowstone's position inside an ancient volcanic caldera has left numerous spots where boiling-hot water periodically shoots into the air or scorching turquoise pools constantly produce hot steam. High mountain peaks pierce the sky above expansive grassy plains that nourish herds of bison. Plenty of other big and exotic animals make their home here too, including grizzly bears, wolves, bighorn sheep, elk, and mountain goats. In fact, Yellowstone holds the largest concentration of mammals in the continental United States. Visitors can experience the park in a variety of ways, including scenic driving, hiking, biking, camping, fishing, boating, cross-country skiing, snowshoeing, and snowmobiling. Yellowstone National Park is in Wyoming (WY). Plan your holiday in Yellowstone National Park and other destinations, from the rural, to the urban, and everything in between, using our United States attractions planner .